Just two days after finding out that ICE detained Seattle resident Daniel Ramirez Medina as collateral damage during a raid on his father’s home, a powerful coalition of immigrant rights organizations came together to say Free Daniel! As a DREAMer and DACA recipient, Daniel is essentially a test case for Trump’s full on attack against our immigrant brothers and sisters. 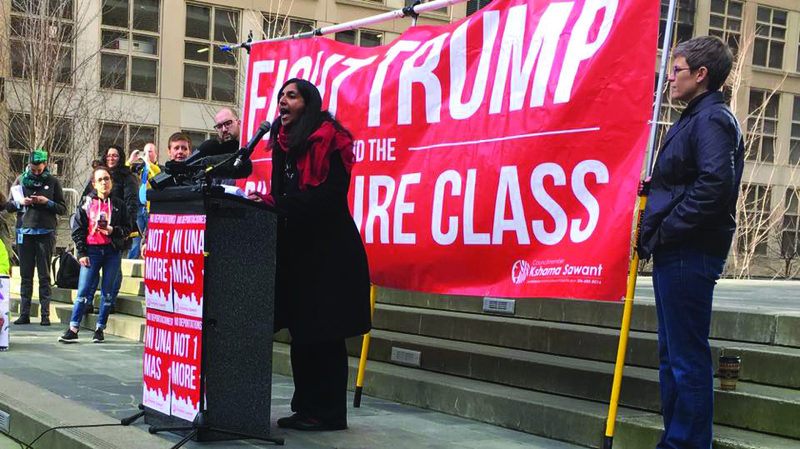 At very short notice, Kshama Sawant and the Resist Trump Coalition called for a protest at the Federal Courthouse on February 17 which brought out 500 people; a rally of a similar size had gathered in New York City the night before. Local immigrant activists were in attendance at the protest, as well as delegations from various labor unions and other organizers. Representatives of SEIU, Washington DREAMers, One America, Socialist Students, and others addressed the crowd. Many spoke powerfully both to the immediate need to protect Daniel, but also how our fight needs to go much further. Seattle City Councilmember Kshama Sawant, an immigrant and member of Socialist Alternative, spoke about the need for Seattle to be a sanctuary city, not just in words but in actions. The march returned to the courthouse to hear a press conference from Daniel’s lawyers and to learn that our fight must continue. A judge delayed making a decision on Daniel’s detention – showing that we need to make our powerful movement of the 99% heard even louder. This protest is a small but important example of the type of sustained and determined struggle that will be necessary to defeat Trump’s attacks on working people, citizens and non-citizens. It also shows again that thousands and indeed millions are prepared to stand up and be part of this struggle.